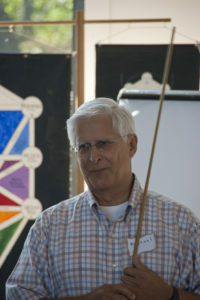 Michael teaching at the Kabbalah and Healing Conference in San Francisco, 2010. Michael Hattwick M.D. is a practising physician with Prosperity Primary Care in Fairfax County, Virginia, USA and Medical Director of InforMed. He is board certified in Internal Medicine and Preventive Medicine and a Fellow of the American College of Physicians. Prior to entering full-time Medical Practice, he was an Epidemic Intelligence Service officer at the Centers for Disease Control (CDC) in Atlanta, Georgia, where he served as Director of the Special Pathogens Branch of the Viral Disease Division Epidemiology Program and as Director of the Surveillance and Assessment Center of the National Influenza Immunisation Program. He has also served as Registrar and Visiting Lecturer at St. Thomas’s Hospital Medical School, London, UK and is a Licentiate of the Royal College of Physicians, a Member of the Royal College of Surgeons and a Member of the Faculty of Community Medicine. After moving to the Washington DC area he served as Chief Medical Advisor and Director of the Health Examination Survey of the National Center for Health Services Research. Since 1978, Dr Hattwick has been a practising primary care physician in the Washington DC area. In 1994 he founded NoVa HealthCare to provide consulting to physicians and health care organisations interested in Clinical Practice Guidelines and Evidence Based Medicine. Dr. Hattwick has been a student and teacher of Kabbalah for many years. He is the author of the book The ABBA Tradition which explores the Tree of Life, the Ladder of Consciousness, the Four World tradition and how Kabbalah facilitates psychological and spiritual development. He also has other titles in preparation or planned. Dr Hattwick received his education at Harvard, Georgetown, and the University of London. He is married to Barbara Carr Hattwick; they have three children and two grandchildren and live in Great Falls, Virginia.